It's been awhile since I've received a Voxbox but, it looks like it's that time again! Influenster sent me their winter Violet Voxbox to review! 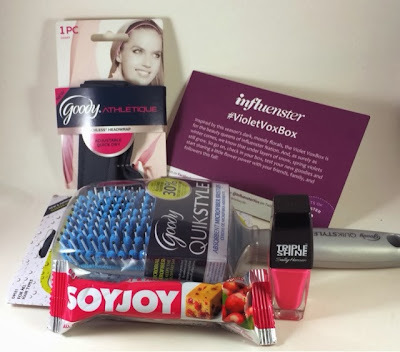 This Violet Voxbox included a Goody Athletique Hairband, Goody Quikstyle Paddle Brush, Sally Hansen Triple Shine Nail Color and a SoyJoy Cranberry Bar. 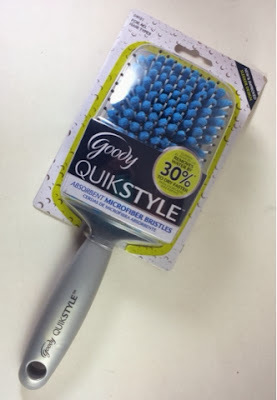 "Good QuikStyle lets you go from wet to beautifully styled hair faster than ever! Super absorbent microfiber bristles remove water as you style. It's like a towel and a brush in one." Funny story, I have actually received the Goody QuikStyle Hair Brush in a previous Voxbox! As with the previous one, I found that my hair did dry faster using this and when combined with a hair dryer cut down my dry time as well. "Goody Athletique provides hold and comfort so you can be physically active and strong in body and mind." 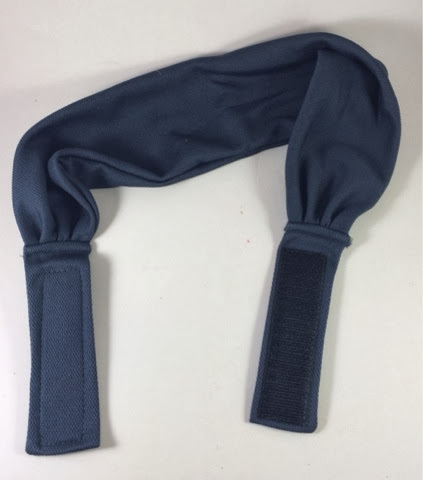 This headband is very wide and made for movement. The cloth is moisture wicking to keep your face dry and then base clasp is velcro which is adjustable to any size. I workout frequently so I've been trying this out. I do like the material it is made of, but I'm starting to hate the velcro. Some of the velcro always ends up snatching up sections of my hair and it can be a pain to remove. 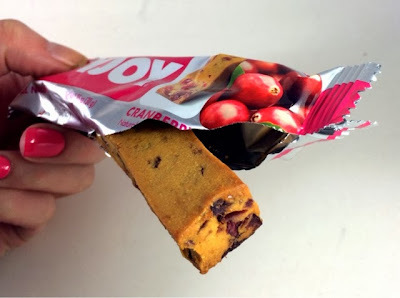 "SOYJOY is an all-natural, gluten free snack bar made with non-GMO soybeans and real fruit pieces. Between 130-140 calories, SOYJOY is a great on-the-go snack or it can be enjoyed warm (unwrap and microwave for 8-10 seconds for a "fresh-baked" experience!) with coffee or tea." I'm not really a big soy fan. I loved drinking chocolate soymilk in college and when I go out for sushi I'll get edemamae as an appetizer but that's the extent of my soy experience. The bar really doesn't look anything like the one on the package! The berries appeared almost black, not pink and rosy like in the picture. It is also really itty bitty. I don't think I've ever had a snack bar that has been this small since Kudos bars when I was a kid. Honestly, this was my least favorite item in this VoxBox. It was very dry and tasteless in my mouth. I took two bites and didn't want anymore. I can't imagine ever choosing this as a snack in the future. Next! "New Triple Shine Nail Color! Daily defense from water and wear. Get ready for the shiniest nails ever! Water to workout, day in and day out, nothing will dull these nails. Available in 30 shades." Sally Hansen's Triple Shine is hands down my favorite product in this box...and not just because I"m a nail junkie. The formula was beautiful and opaque, the brush was easy to use and the color is super glossy. I'm not usually a pink girl but with this shade and easy of application I don't mind! I'm excited to hear there are 30 shades, I am going to head to my closest CVS to find some more. Overall this box was half hit, half miss. The Goody Brush and Sally Hansen polish were fantastic! 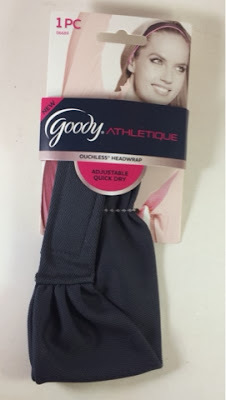 The Goody Hairband did a great job but I had issues with the velcro tangling with my hair and the SoyJoy bar was just not for me. I received these products complimentary from Influenster for testing purposes. If you'd like an invite to Influenster I have a few spaces left so leave a comment below letting me know!